Fingerskate 5 RAIL SESH - Real skateboard GRINDS at your fingertips! FINGERSKATE 5 RAIL SESH - THIS IS THE RAIL VERSION! INTRODUCING GRINDING TRICKS . . . The FIRST Fingerboarding GRIND simulation optimized for IPHONE 5- with all new gameplay never seen before! Fingerskate 5 Rail Sesh was developed with knowledge of skateboarding itself. It uses unique finger and flick control to accurately flick and perform grinding and sliding tricks. Using POP control and a simple FLICK, all your favorite skateboard grinding tricks can be done easily and effortlessly whenever you decide to play. CATCH the board! 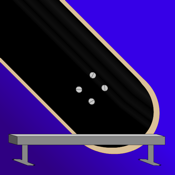 In order to master tricks, you need to react in time to catch the board with your fingers and land on the bolts - just like a real life fingerboard. New tricks and features being added regularly - offered at a FRACTION of competitors - it's addicting and fun. Fingerskate 5 - Cheaper than a fingerboard, easier than a fingerboard, JUST like a fingerboard.